Women protest income inequality in Reykjavík, Iceland, October 24, 2016. Photographer: Arnþór Birkisson. On June 1st 2017, Alþingi, the Icelandic Parliament, passed a law mandating that all companies and employers with 25 or more employees prove that they pay men and women equal wages. This change was accomplished through an amendment to Article 19 of the Act on Equal Status and Equal Rights of Women and Men. The article states that employers need to undergo equal pay certification using the Equal Pay Standard, an equal pay management system developed by Icelandic trade unions, the employers’ confederation and government officials. Employers are expected to renew their equal pay certification every three years. The law took effect on January 1st 2018 and employers with 250 or more employees need to have implemented the equal pay standard by 31 December 2018; employers with 150-249 employees need to have completed their first certification by 31 December 2019; employers with 90-149 employees by 31 December 2020; and employers with 25-89 employees by 31 December 2021. However, all state ministries need to have undergone their first certification by 31 December 2018, and state institutions and companies owned by the state with 25 or more employees by 31 December 2019. Employers who fail to undergo certification are faced with daily fines. The amount of per diem fines has not yet been decided, but according to Article 18 of the Act of Equal Status and Equal Rights of Women and Men, fines can be as high as ISK 50.000 ISK per diem. Iceland has had legislation supposed to guarantee equal pay for men and women for a very long time. In fact, we passed the first legislation mandating equal pay for men and women in Iceland over half a century ago, in 1961. 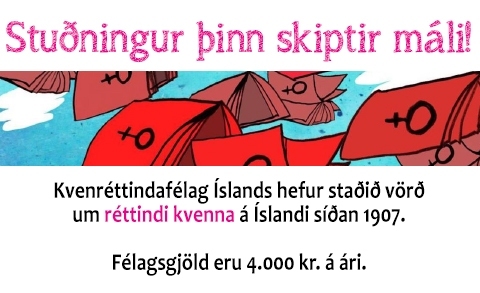 At the time, the members of Alþingi were hopeful that full pay equality would be reached in only six years, in 1967. Perhaps a naive hope, but then again, what can we expect from a legislative body which at the time had only two women members :D.
Unfortunately, economic gender equality was not reached in six years. So we in Iceland passed a new comprehensive Equality Act in 1976, and one of the articles stated that women and men be paid the same for work of equal value. Alþingi passed yet another updated Equality Act in 2008 with the same provision that men and women be paid equally for equal work. Still, men are still being paid more than women, despite legislation which is supposed to guarantee equal wages. The Equal Pay Standard was written in cooperation between the labor movement, the employers‘ confederation and the ministry of labor and finance. 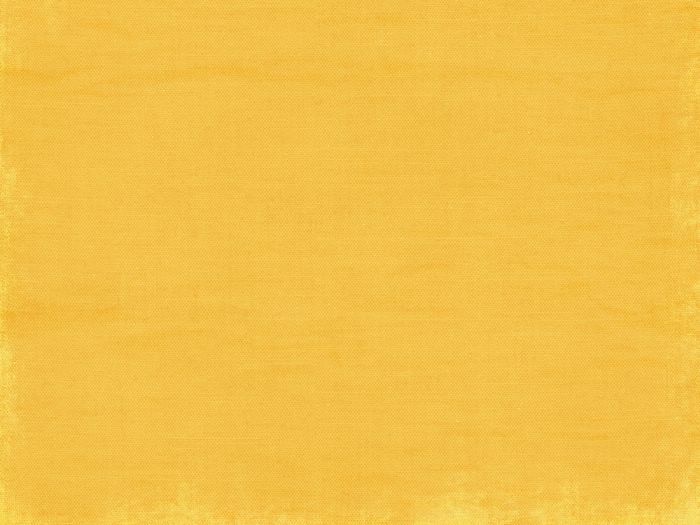 The standard is a set of rules and guidelines which analyze the pay structure within a company, and show whether or not men and women are paid equal wages for the same or equal value of work within the workplace. When companies and institutions have fulfilled the requirements of the standard, they receive certification that they have complied with the standard. The Equal Pay Standard was introduced in 2012 and several companies had already undergone voluntary certification using this standard. Of course, now, many more companies will implement the standard since it is mandatory! Making certification based on the Equal Pay Standard is a logical next step in our efforts in Iceland to combat gender inequality and the gender pay gap. In current Icelandic law, companies with 25 or more employees are already required to have a gender equality plan (see article 18); and boards of companies with 50 or more employees are required to have gender parity (60/40 at least). The Equal Pay Standard was written to conform to international standards and accepted practices in ISO standards, and our hope is that it can be translated and implemented in more countries around the world. The standard is already available in English, here. We have collected information about the Equal Pay Standard available in English online. Click here to read more. The gender pay gap adjusted for working hours is now 16% in Iceland, but the unadjusted gender pay gap is much higher. The average wages of women in Iceland are only 72.5%% of the average wages of men. One of the main reasons women work fewer hours in Iceland than men, is that women are performing unpaid labor in the home and for the family. We at the Icelandic Women’s Rights Association believe that we need to look to the larger unadjusted figure to measure the gender pay gap, not the lower figure adjusted for working hours. 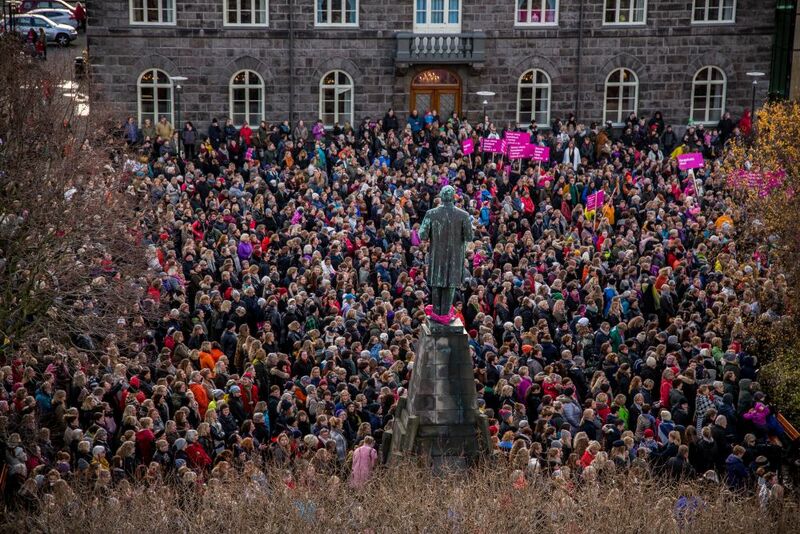 Women in Iceland have walked out of their jobs five times in the last 42 years to protest the gender pay gap. On October 24th, 1975, women all over Iceland left work to demonstrate the importance of women’s contribution to society. This day was popularly called “kvennafrí”, or Women’s Day Off. In 1985, 25,000 women left their work again, to protest income inequality. In 2005, we celebrated Women‘s Day Off for the third time and tens of thousands of women left work the minute they stopped getting paid, at 2:08 p.m. In 2010 women in Iceland again left work, this time at 2:25 p.m. And in 2016, women left work at 2:38. Today, the average wages of women in Iceland are only 72.5% of the average wages of men. Therefore, women have earned their wages after only 5 hours and 48 minutes, in an average workday of 8 hours. This means that, if the workday begins at 9 a.m. and finishes at 5 p.m, women stop being paid for their work at 2:48 p.m.
We have gained only 40 minutes in twelve years. If progress continues at the same pace, we will need to wait another 35 years before women in Iceland have the same wages on average as men, in the year 2052! Kjarajafnrétti strax! Income Equality Now!